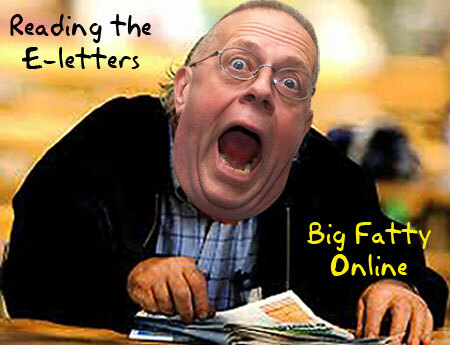 The Fat One has a unique LITTLE show today with voiceletters, nattering and a letter that made the Fat One kerfuffle. Happy National Peanut Butter Day. Posted by Big Fatty in Podcasts on January 24th, 2019 ‌ Both comments and pings are currently closed. How many tuna sandwiches could I get for a Bernadette, I wonder? Pretty sure he started out as tight end and finished up as a wide receiver. Not sure what WoW is Kathy? Maybe a Queensland thing? There are gyms called Workout World that use WoW. Homo, the rebel. But I will accept WOODHAVEN. I remember that one contest I nagged the hell out of me PP NYC to call in. And he did. Oh, those were the days. I always loved listening to the LK Today podcast. Great cooking and wonderful voice. Happy birthday to that hunk, LK. I need to blow it out with Bigfatty. This week has been the absolute worst at work. What has happened to integrity and character as work values? I cackled at Woodhaven. I had forgotten about that! Fart. Tell the people they can use a different name here as long as you know who they really are. Haha Buddha! I nagged so many people back in the day. Hope Big Fatty takes the LK out to that BBQ place for a nice birthday lunch. If someone came knocking on my door at midnight looking for humpity bumpity, I’d tell them to kick rocks. People need their sleep! I don’t know how you do it. Also, have I mentioned how pretty Miss Bacon is? She is pretty No1Daddy but flattery won’t get you anyway closer to Mr Benjamin, because not only is she (really) pretty but she is also smart and obviously the most intelligent member of the Fatty family who always dresses with upmost style and elegance. Oh, did I mention that she won the Needreba Annual Single Hand Cartwheel Contest three years in a row now?